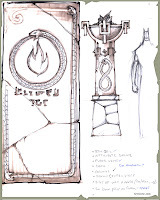 Concept sketch of an eternal flame & Door for the City of Lost Souls located prior to the river Styx. For some reason, the figure I put in for scale ref has taken on the form of Batman. What can I say, Batman is cool.